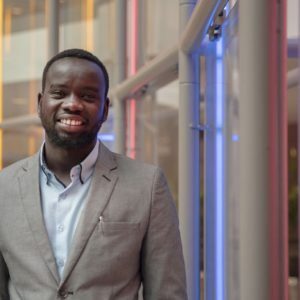 John Awiel Chol Diing (’19, South Sudan) is a fourth-year Agricultural Sciences student at EARTH University. At a young age, he fled the unspeakable violence raging in his homeland. Having grown up as a refugee, he was intimately acquainted with food and water insecurity. To overcome his situation, he has ardently pursued education and leadership development. Recently, he attended the Global Food Security Symposium in Washington, D.C. In the following interview, he tells of his experience at the event. What was your role at the symposium? I had the opportunity to form part of the New Generation 2019 delegation. This group was composed of 20 distinguished students from diverse disciplines, such as health, food science and agriculture, among others. It was a really interesting working group of young people from various universities and countries. During the sessions with the delegation, I was able to share my knowledge of agriculture and contribute to the discussion. In which activities did you participate? I was in a session called “Solution”, in which we each had five minutes to answer the question: “What makes water personal to you?” It was an amazing opportunity in which we all shared about past experiences, memories, meetings and conversations. Really significant reminders emerged from that, demonstrating what food insecurity and water scarcity mean to each one of us. I also participated in the main day of the symposium. In that activity, experts from different sectors came together to share their thoughts on those issues of scarcity. At the Global Food Security Symposium, John tells his personal story of struggle and the need to protect water resources. What was the most important part of the event? It was really meaningful to see representatives from the food industry, nonprofits, business, government and academia, working together with the agricultural sector for the conservation of the precious resource of water. [This collaboration] acquires relevance when we realize that water scarcity isn’t exclusively an agricultural problem. All sectors must get involved and work toward sustainable solutions to resolve this crisis. What is your greatest takeaway from the symposium? One of the main things I learned was that water isn’t only for drinking, food or business; it goes beyond that. It’s about dignity. If you don’t have water for drinking or preparing meals, you are stripped of your dignity. I also learned that the agricultural sector must think of holistic alternatives to ensure water is used responsibility and scarcity is prevented. It’s important to involve smallholder farmers in this discussion because they are a significant part of the agricultural activity worldwide. Of all the conferences in which I’ve participated, this one was very significant because it dealt with the subjects of crisis and insecurity – and those are my two main areas of agricultural interest. The Global Food Security Symposium offered me the chance to focus my efforts on resolving world problems. Without a doubt, it was an opportunity to better understand food security at a global level. What are the primary obstacles to achieving food security? The main challenges to food security are water scarcity, lack of governmental policies that support smallholder farmers, and climate change. How has your experience at EARTH influenced your development as a leader of change? It’s clear to me that every drop of water that we waste intensifies the threat. Being a student at EARTH University, I am committed to transparency and the development of sustainable, lasting solutions to the problems afflicting society. EARTH University and the Global Food Security Symposium tackle the issue by seeking sustainable solutions that address its main challenges. To learn more about John’s story, read this article from U.S. National Public Radio (NPR) in which he was featured.